Neuron-specific PERK inactivation did not influence T cell priming in the peripheral immune system during EAE. (A) BrdU cell proliferation assay shows that neuron-specific PERK inactivation did not significantly change T cell proliferation in response to MOG 35–55 peptide. n = 5 animals. Error bars represent SD. Statistical analyses were done with a 2-way ANOVA with a Tukey’s post test. 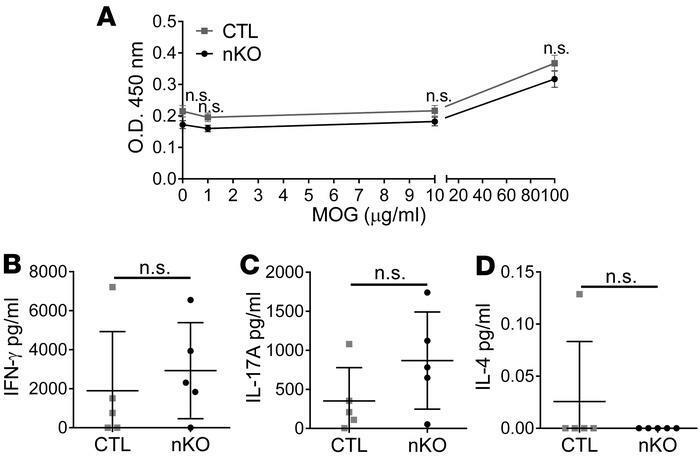 (B–D) ELISA assays show that neuron-specific PERK inactivation did not significantly change the ability of T cells to produce IFN-γ, IL-17A, and IL-4 in response to MOG 35–55 peptide. n = 5 animals. Error bars represent SD. Statistical analyses were done with a 2-tailed t test.